Lock in a great price for Mayfair Hotel – rated 8.2 by recent guests! Great location. Great facilities - pool and gym as well as cafe if you were having a slow day. The hotel was immaculate. The staff were very friendly and helpful. The rooms were stocked with tea and coffee and just the basic toiletries. Breakfast was a bonus and, with the amount of people the hotel catered for, no request was too great. The bed was uncomfortable, thin mattress and scratchy sheets. Reception was helpful with directions, storing our bags and explaining the nearby area. The shower was very nice as well. Everything was to my satisfaction and more, it deserves to have a higher star rating, will use this hotel again next time I am over in Jersey. everything, the hotel is beautiful, clean, it was very cold when we arrived and the bedrooms were lovely and warm and cosy. The bathrooms are nice and big, warm, clean and very modern, ate on one of the evenings, set menu but the food was lovely, it is a small walk into town. We came over as a family of 4 for my Daughters wedding, and everyone was very pleased with the hotel. Very pleasant and helpful staff. The added addition of the hotel Coffee shop is a lovely idea, we enjoyed our hot drinks, it is beautifully decorated and warm and cosy. They also do nice meals in there. I though tea and coffee facilities in the room were very well stocked. Excellent breakfast, 5 minute walk to shopping in city centre, parking available. Mayfair Hotel This rating is a reflection of how the property compares to the industry standard when it comes to price, facilities and services available. It's based on a self-evaluation by the property. Use this rating to help choose your stay! 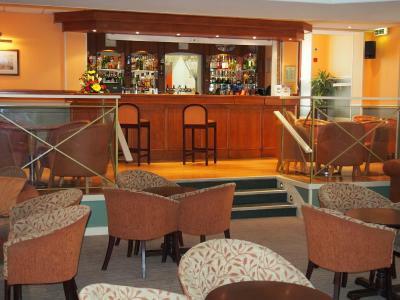 With a swimming pool, gym and evening entertainment, Mayfair Hotel is just a 10-minute walk from St Helier’s center. It also has a restaurant and offers free parking and free Wi-Fi in public areas. Spacious rooms all feature a TV, radio and free tea and coffee. Private bathrooms all have a hairdryer, while some rooms also have a flat-screen TV and a separate seating area. Guests can relax in the Mayfair’s spa pool, steam room or rooftop sun terrace. The games room has video games and a pool table. The dining room offers breakfast and a daily-changing dinner menu. 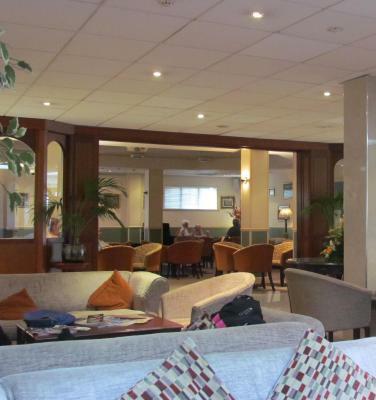 Light snacks and drinks are provided in the relaxed coffee shop and lounge. 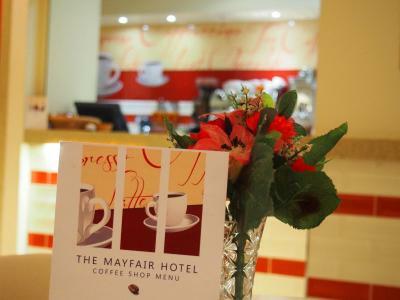 When would you like to stay at Mayfair Hotel? This room includes a TV, radio, and tea and coffee making facilities. The private bathroom has a hairdryer. This family room with bunk beds includes a TV, radio, and tea and coffee making facilities. The private bathroom has a hairdryer. Spacious room with a separate sitting area and sofa. Rooms are 13 square yards. House Rules Mayfair Hotel takes special requests – add in the next step! Up to two children under 16 years are charged GBP 10 per night when using existing beds. 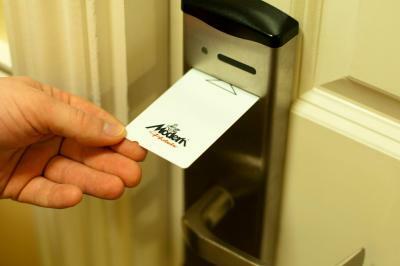 Mayfair Hotel accepts these cards and reserves the right to temporarily hold an amount prior to arrival. Please note that parking spaces are subject to availability. Tables in the restaurant far too close to each other. Games room very poor as only one game working, pool table had hardly any balls and no cues! Couldn't use the swimming pool as hotel was booked with over 100 children on sports advent, very busy. Great food options for breakfast and location. 10am checkout. Also tap plunger to divert water from bath tap to shower head didn't work. Put a soap bar and spoon in to hold it in place. Cleaners just removed spoon and left the soap in place lol. I didn't request it fixed which I maybe should have. So as much my fault as theirs. Also not suggesting the cleaners weren't good. The place was very clean. Just a maintenance problem. Some facilities (like the sauna) not available during our stay. unfortunately during our visit the steam room and the jacuzzi were both out of use. food was excellent with a good choice of food. 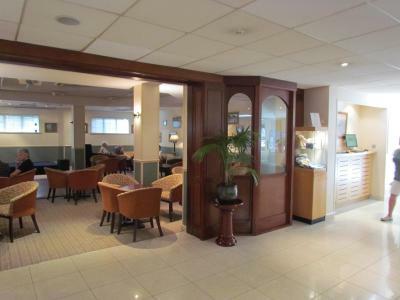 the location was good with easy walking distance to the bus station and St Helier centre. Bedroom clean and tidy. All staff very friendly and obliging. Poor state of repair of leisure facilities. No jacuzzi or steam room. Bad drain smell throughout. Swimming pool poor and jacuzzi and steamroom did not always work. Nice bathroom and spacious room. The reception staff were excellent. Didn't like listening to the rugby speeches whilst I was having my dinner. Bath water not always very hot. The staff in the restaurant run around like rabbits. 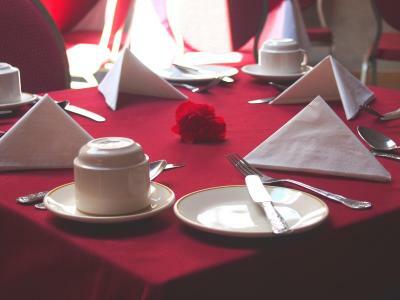 And couldn’t wait for you to go so they could get the tables ready for the evening dinners. We felt rushed. The breakfast were very good and the staff on a whole ok. When we arrived we were on the first floor very noisy traffic going passed half the night. We asked to be moved they did move us to the fourth floor at back of the building. The room was very quiet. The room was at the very end of building. The WiFi coverage was hit and miss not good at all. The room itself was very dated. My self and husband are in are 60-70s having to climb in and out of the bath to have a shower was to say the least precarious it’s about time they installed walk in showers. The bed was the most uncomfortable bed we have ever had to sleep in they need changing as well. The staff were very helpful and courteous at all times the entertainment was very average when there was some. I would not recommend this property for youngsters apart from the pool there’s not much for them to do. We have been going to that hotel for a number of years and have enjoyed the facilities this year we may think twice about booking again next year unless they update it.